We are excited that you want to join the Boy Scouts of America! Participating in the Scouting program whether you're a Scout, parent, or volunteer is a fulfilling experience. We promise, this will be an adventure of a lifetime. You've made a great choice to explore the fun and adventure of Scouting! Click here to get your child(ren) started in on the adventure. When compared to the cost of sports and many other activities, there is no doubt that Scouting delivers great value! The registration fee to join is $33 annually. In addition, there are one-time uniform costs and normal activity fees that may be charged to your local unit. Of course, these costs may be offset by unit fundraising and other available fundraising funds. Contact your local unit leadership for details. We understand that parents want to know what kind of involvement is expected of them when their child joins a program. The BSA invites and encourages all parents to be involved with their youth's development by volunteering themselves. 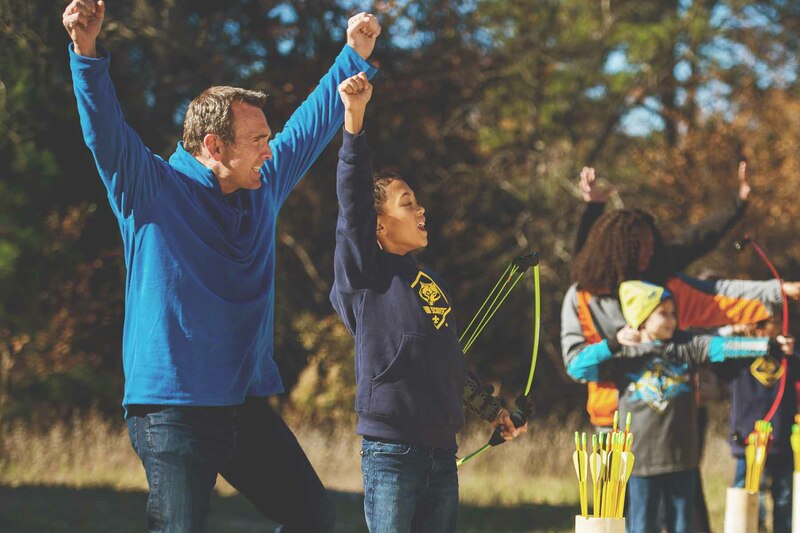 The Scouting organization is a great way for family time and home-centered learning. Thank you for your interest in volunteering! There is nothing more rewarding than helping young people take their first steps down the path to success. It's easy to get started! Simply fill out the form above by clicking "Volunteer!" and someone will contact you to guide you step-by-step through the process. Already registered as a volunteer? Get started with trainings, program resources, and more! but will have a positive impact in your surrounding communities. If you're interested in sponsoring a unit, awesome! We are here to help you through the process. organizations whose objectives, mission, and methodologies are aligned with those of the Boy Scouts of America. The chartered organization is responsible for a $40 annual charter fee per unit. The general liability policy provides primary liability insurance coverage for all chartered organizations. Click here for additional insurance information. Click here to view all the responsibilities of the chartered organization. What does the future of Scouting look like? On May 8th, 2018, The Church of Jesus Christ of Latter-day Saints announced that it will no longer charter Scout units after December 31, 2019. This has led to many questions about what Scouting will look like now and in 2020 in the Utah National Parks Council, which is made up predominantly of LDS units. Click here for an FAQ that answers the Council's top questions. How can I stay in Scouting after 2019? Want to be involved in Scouting after 2019? Fill out this survey. How can I start a new unit (pack or troop)? Wanting to start a new unit (pack or troop)? Use this checklist to get started today! How can my son or daughter join a unit? We are so excited that your son and/or daughter want experience the Scouting adventure. Fill out this survey and someone will contact you shortly about joining a unit! The Boy Scouts of America opened its programs to serve the entire family. While girls have been able to join in the older youth programs, it wasn't until June 2018 were girls aloud to join Cub Scouting and coming in February 2019 girls can join the Boy Scouting program as well. By welcoming the entire family into the programs, even more people will have access to the character development and values-based leadership that Scouting offers. Click here for more information about Family Scouting. How do I submit an online application for youth or adults to a specific unit? Click here to get more detailed instructions on submitting an online application for youth or leaders, when you already know the unit you are joining. A unit is an organized group of youth, such as a Cub Pack, Scout Troop, Venturing Crew, Exploring Post, or Sea Scout Ship. A district groups many units into one geographical area, district leaders work with volunteers to ensure growth and success of Scouting units. A council is the structure used by the National Boy Scouts to organize volunteer training, properties, financial support, advancements, etc for a group of districts. How to transfer youth to another unit? Transferring youth within Utah National Parks Council can be completed by having the Chartered Organizational Representative email the transferring youth information to help@utahscouts.org. Can youth be registered in more than one unit? Yes, youth can be registered in more than one unit. Can my son still earn his eagle after 2019? Yes! All Scouts on the Trail to Eagle are encouraged to stay in Scouting and continue pursuing the rank of Eagle Scout and beyond, until they are 18. However, Scouts within Church units that desire to become Eagle Scouts while still in their ward unit still have the opportunity to do so, provided they progress with this timeline (and its deadlines) in mind. When can I register my daughter? As of February 1, 2019 girls are welcome to participate in all programs of the Boy Scouts of America. Click here to learn more on how to join the adventure!